View of Elise Siegel's 24 Feet (foreground) and 21 Torsos (background), both ceramic and mixed mediums, 2004; at Garth Clark. Lined up demurely in two tidy facing rows, the dozen little girls of Elise Siegel’s 24 Feet seem to squirm in their straight-backed wooden chairs. 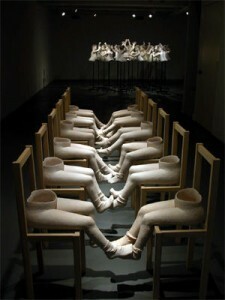 Given only from the waist down, their hollow bodies are formed from hand- shaped, fired and painted clay. But their emotional presence is made vivid by their feet. Flexed and pointed, toes curled and spread, they communicate with uninhibited eloquence, mitigated not one bit by the sagging, rumpled little anklet socks with which every foot is shod. 24 Feet has an innocence so potent that the question of sentimentality is mooted. As she did in her 2001 installation — a circle of seated clay children staring expectantly toward the gallery’s door — Siegel virtually disabled cynicism by plunging viewers straight into a total immersion in childhood. This kind of psychological quarantine was imposed even more forcefully by 21 Torsos, the other installation on view here (both were completed in 2004). In diametric opposition to the linear rectitude of 24 Feet, here 21 little monsters were engaged in fists-flying mayhem. Shown sans legs, raised off the floor on wheeled metal stands, they formed an unstable cloud of silent strife. As with the girls in 24 Feet, each figure is individualized, though they share basic features: cropped hair makes them boyish; they look roughly seven or eight years old. Tight- fitting sleeveless T-shirts make their bodies seem all the more tender. Their pudgy little hands are variously balled for punches, or raised in preparation for an opened-handed smack, fingers spread wide. Some reach forward, and many come close to contact without ever consummating the aggression; again, as with 24 Feet, no two figures ever quite touch. Facial expressions range from quizzical to actively belligerent — most mouths are grimly shut, or slightly opened in thin – lipped scowls. But their raised eyebrows, small, deep-set little eyes and pale, doughy skin lend these children an air of vagueness, even helplessness: they seem somehow unsure about how they’ve wound up in this angry, irresolvable muddle. That uncertainty is enhanced by the figures’ postures. Tipped slightly forward, their backs arched and rear ends a little raised, heads just slightly inclined toward each other in groups of two or three, they could be putti in a ceiling painted by Tiepolo; only the wings are missing. Or, they could be juvenile versions of the teeming naked fighters in the famous engraving by Pollaiuolo, all arms raised, every martial posture illuminated. It’s harder to find contemporary comparisons for Siegel’s work. Judy Fox’s suavely seductive painted-clay children come to mind, as do Kiki Smith’s cast-bronze figures drawn from fairy tales. But in Siegel’s pieces, there’s no allegory. No secondary language of psychological symbolism is at work. Rather than serving as ventriloquists’ puppets for adult expression, Siegel’s children seem to speak only for themselves. Leaving us thereby at a loss for words is not the least of their provocations.